Nissan is known for making innovative cars. The new GT-R takes that to new levels. This popular sports car is one of the sleekest, chicest cars on the road today. It's also one of the most powerful. The GT-R features a twin turbo 3.8L engine that cranks out a truly insane 565 hp and 467 lb.-ft of torque. Each engine is built by hand, to ensure the highest quality. The 2019 Nissan Armada is a large and powerful full-size SUV. A fleet of features that include incredible power and towing capability gives it the right to bear its illustrious name. The Nissan Armada sets the performance dinner table with a crisply powerful 390hp engine that also pushes over 394 foot-pounds of torque. A roof rack makes it easier to transport a boat, bike or other large items without needing a trailer. At Jenkins Nissan, we want you to know how to make the most of this feature on your car or SUV. The most important thing to do when installing a roof rack is to read the directions. It is important for you to get into a high-quality vehicle, something that will drive well and that you will feel confident in. The Nissan Certified Pre-Owned vehicles that are available give you everything that you are seeking to make every driving experience a good one. When you purchase a used vehicle, you want to have access to features that will look out for you if something goes wrong. The satisfactory performance of any vehicle on the road today is directly linked to its ability to deliver substantial power as needed. The Nissan Versa Sedan is rated among the most popular sedans in the subcompact category thanks to its engine output and the power delivery system of its transmission. The Versa Sedan 1.6-liter engine is designed to continually adjust the engine output due to variable valve timing. The Nissan LEAF is a popular, compact electric vehicle that will get you where you need to go without having to worry about prices at the pump. On a full charge, the LEAF has a 150-mile range and more than enough power to make you forget that you are driving an electric vehicle. Let’s explore this a little more. Lakeland families who are searching for a new subcompact SUV would be well advised to take a closer look at the brand-new Nissan Kicks. As well as being incredibly good-looking, the Kicks also features some of the best gadgets and tech features of any vehicle in its class. Here at Jenkins Nissan, we are particularly fond of the built-in Apple CarPlay and Android Auto systems. These features provide the driver with access to their favorite apps without ever needing to root around to find their cell phone. The Kicks truly takes connectivity to the next level. For Lakeland drivers who are searching for a high-performing sports car, the new Nissan 370Z Roadster might just be the perfect option. Filled with all of the performance features that you might expect from a modern sports car, this vehicle is sure to put a smile on your face. The staff here at Jenkins Nissan have certainly been impressed by the 370Z Roadster's amazing engine. The 3.7L monster delivers 332 horsepower and up to 270 lb-ft of torque and provides plenty of thrills all the way up to its 7,500 RPM redline. 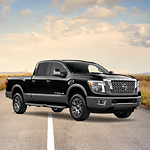 The interior carrying flexibility of the Nissan Titan XD is unrivaled around Lakeland. You can fold down the seatback in the rear to create a flat desktop. Flip up that same seat and you gain access to covered storage. For a flat loading floor in the back, fold out the panel cover from the cargo organizer under the rear seat. At Jenkins Nissan, we like to highlight the towing capabilities of the Nissan Titan XD. Switching the transmission to Tow-Haul Mode minimizes gear hunting and produces more confident and smoother hauling.